WASHINGTON – House Democratic leaders are set to advance sweeping internal rules changes Thursday that would attempt to bring more sunshine to congressional governance and defuse a pair of political powder kegs that wreaked havoc on GOP leaders over the past eight years. But in their first day of power in the new Congress, Democrats must stave off a liberal rebellion after prominent Democrats said they would oppose the entire rules package that has been carefully assembled by Rep. Nancy Pelosi, D-Calif., and a top lieutenant. Rep. Ro Khanna of California and Rep.-elect Alexandria Ocasio-Cortez of New York said they would vote against the rules changes – in the second vote Democrats will take in the majority after ostensibly electing Pelosi as the new speaker – because of the inclusion of a fiscal measure known as “pay as you go,” or PAYGO. That rule, echoing a provision in federal law and in the Senate’s rules, would require the House to offset any spending so as not to increase the budget deficit. So far, Democrats have given no signs of needing to revise the measure to win votes – and assuming its passage Thursday afternoon, Pelosi plans to move quickly to vote on legislation that would reopen portions the government that have been closed for nearly two weeks amid a standoff over money demanded by President Trump for a border wall. Rep. Jim McGovern, D-Mass., the incoming chairman of the House Rules Committee, has spent months putting together the proposals to create, in Pelosi’s wording, the “most transparent” House ever. That is set to be followed by the introduction, later this week, of a broad campaign and government bill – one titled “H.R. 1” to emphasize its importance to House Democrats, though the GOP-controlled Senate remains a probable obstacle. Under the rules proposals, legislation would have to be vetted by relevant committees before it hits the House floor, and there would be a 72-hour window from the time a vote is scheduled and when the roll call actually happens. In a nod to a bipartisan group of centrists, legislation or amendments with broad support would get special privileges in committees and on the House floor – that provision brought a public endorsement from a Rep. Tom Reed, R-N.Y., a rare move on what is almost always a party-line vote. In addition, McGovern included two proposals designed to overcome the hurdles that GOP leaders faced time and again from the party’s most ideological flank. First, Democrats are allowing the House to approve an increase in the nation’s borrowing limit without an actual vote, instead having it deemed approved each time the House approves its annual budget resolution. Under GOP rules, what is often called the debt limit vote was separate and led to many tense battles with conservatives who wanted to hold the federal borrowing authority hostage in exchange for other demands. In addition, Democrats are eliminating a rarely used rule that allowed any lawmaker to file a motion to force a vote on ousting the speaker. First, John Boehner, R-Ohio, then Paul Ryan, R-Wis., faced steady threats from conservatives about forcing them out of office through these means. Now, under McGovern’s rule, it would take a majority of House Democrats to support a resolution to even force a vote to vacate the speaker. That would take away power from ideological firebrands, but this week, caucus liberals such as Khanna and Ocasio-Cortez – and activists on the political left – focused their ire on the PAYGO proposal. Defeat of the rules legislation would be an embarrassing setback for Pelosi that could herald future division in the Democratic caucus. More importantly, for the short term, the House cannot proceed with legislative business at the start of each new Congress until the rules are settled. Two years ago, at the start of their last term in power, Republicans faced a revolt when they advanced proposals that gutted the power of an ethics body, causing a last-minute rewrite of their rules package. The liberal hard-liners argue that PAYGO amounts to a legislative straitjacket that could impede their efforts to pass ambitious social programs. And they are especially dubious of its necessity after congressional Republicans waived the law in 2017 to pass a tax bill that added more than $1.5 trillion to the federal deficit over its first decade. Ocasio-Cortez announced her opposition in a tweet: “PAYGO isn’t only bad economics . . . it’s also a dark political maneuver designed to hamstring progress” on health care and other legislation, she wrote. 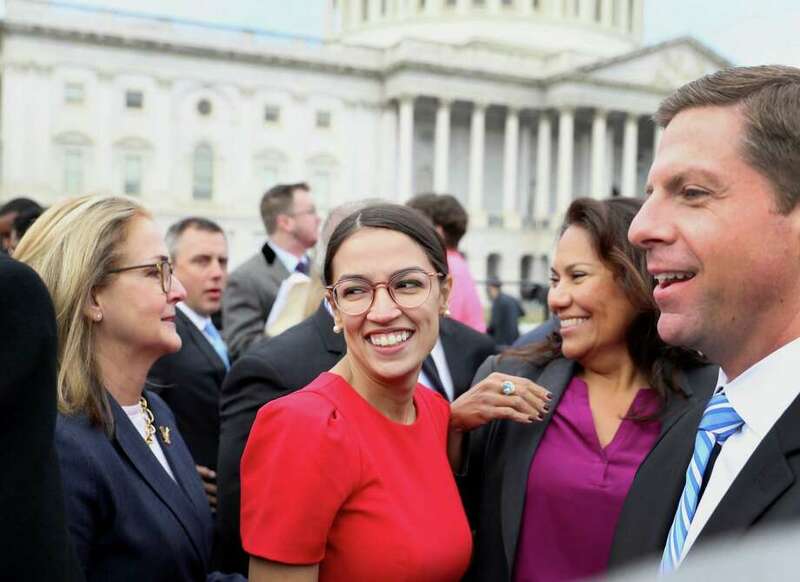 Beyond Khanna and Ocasio-Cortez, however, opposition to the proposal appeared muted Wednesday. Several high-profile freshmen Democrats – Reps.-elect Rashida Tlaib of Michigan, Ilhan Omar of Minnesota and Ayanna Pressley of Massachussets – have not taken a public position. Rep. Tim Ryan, D-Ohio, said in a statement that PAYGO “is a no go for me” and that the rule could obstruct “critical investments in education, infrastructure, and health care,” but he stopped short of saying definitively that he would vote against the rules changes. Reps. Mark Pocanm D-Wis., and Pramila Jayapal, D-Wash., the co-chairpersons of the Congressional Progressive Caucus, said they would support the overall rules package despite their opposition to PAYGO, citing a commitment from House leaders that the provision “will not be an impediment to advancing key progressive priorities” in the new Congress. House Democratic leaders agreed last year to drop another rule proposal opposed by Pocan and Jayapal, one that would have made it more difficult to pass legislation raising taxes. The PAYGO rules date back nearly 30 years, to Congress’ initial attempts to rein in the budget deficits of the 1980s. But the rules fell by the wayside amid the budget surpluses of the 1990s. When Democrats took control of Congress in 2007, they included PAYGO provisions in their rules; in 2010, they wrote it into federal law. But Republicans never included the measure in House rules, and the law has been repeatedly waived over the years – making its practical effect questionable. Drew Hammill, a spokesman for Pelosi, tweeted in response to Khanna on Wednesday, pointing out that the federal law remains in place regardless of what rules House Democrats adopt – and that including the measure in the rules would allow Democrats to “designate appropriate offsets” rather than allow the Trump administration to make the across-the-board cuts mandated in law. “A vote AGAINST the Democratic Rules package is a vote to let Mick Mulvaney make across the board cuts, unilaterally reversing Democratic initiatives and funding increases,” he wrote, referring to the budget director and acting White House chief of staff. The Washington Post’s Paul Kane contributed to this report.